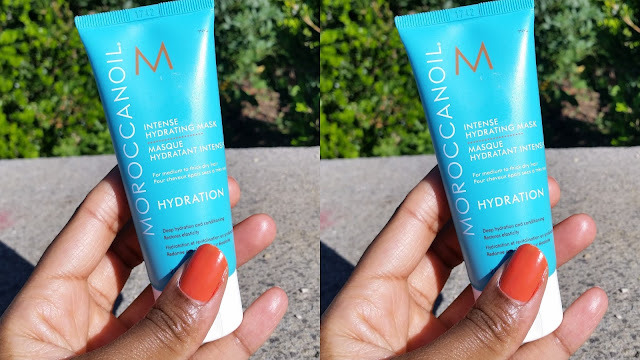 My review on the Moroccanoil Intense hydrating mask. Hello readers today I am doing a review on the Moroccanoil intense hydrating mask for dry to very dry hair. I have known this brand for a while and I have always wanted to try their hydrating mask but the very high price (€34/250ml $35 or £25 for8.5oz) always prevented me from buying it. This past summer, while I was on vacation in Canada I came accross a store that was selling this brand and this store also sold deluxe sample. The price was still kind of expensif but still more affordable. A couple months ago I decided to finally try this mask and my results are the following. 1-This product has a strong smell that I like. 3- I love the fact that you don't need to use a lot of product to cover your hair. A little bit goes a long way. 4-The mask has a white creamy texture that is very easy to apply on the hair. 5-I use this mask like all my masks. I let it sit on my hair for 15 minutes, with heat. The result was super hydrated hair (not greassy), with great elasticity, that is easy to detangle. 6-For those who don't like silicone in their hair products, be aware that dimethicone is the 5th ingredient on the list. To sum up I love this mask, because it does exactely what it states. Now is it worth spending so much money ? Well it all depends on your budget... You will not be disapointed if you buy it but that won't be the end of the world if you don't! Warning! This mask is for dry to very dry hair with medium to thick density. Will I buy it again ? Yes I could buy this mask again , but because of the price it is not a mask that I would repurchase on a regular basis.